WASHINGTON — Determination and resolve, mixed with frustration and anger, are guiding a new round of resolute activism to reshape federal gun laws. The drive is fueled largely by high school students who survived yet another mass school shooting, this one Feb. 14 at Marjory Stoneman Douglas High School in Parkland, Florida. Seventeen people, including 14 students, died in the assault that a former student armed with a semiautomatic rifle carried out, according to police. He was said to have shown signs of mental illness. The incident left a country wondering how such incidents could happen again and again and again. The number of mass shooting incidents across the country in recent years is alarming. This year 34 mass shootings, resulting in 60 deaths and 144 injuries, have been recorded by the online site Gun Violence Archive. The Feb. 14 incident was the most serious by far. The site defines a mass shooting as any incident in which four or more people were killed or injured. The data reveals 346 mass shootings in all of 2017; 383 in 2016; 333 in 2015; and 271 in 2014. In response to the Parkland incident, students nationwide walked out of classrooms Feb. 21 to call on lawmakers to adopt stricter gun laws, boost school security and fund what they see as a woefully inadequate mental health care system. A walkout of sorts also was undertaken in the Archdiocese of Miami, in which Parkland is located. High school students were given the opportunity to gather on athletic fields on their campuses for 15 minutes of reflection about their response to the violence. “We were able to have our kids participate in the spirit of it,” Miami Archbishop Thomas G. Wenski told Catholic News Service. The question remains: How will elected officials respond to the student demands? 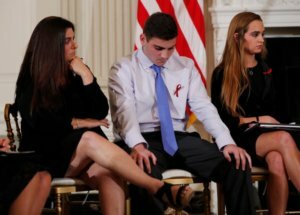 At the White House in Washington, President Donald Trump held “listening sessions” with Parkland high school students, parents and teachers, among others, in an effort to formulate a response to mass shootings. Attendees included victims of the 1999 shooting at Columbine High School in a Denver suburb and the 2012 shooting at Sandy Hook Elementary School in Newtown, Connecticut. At least one policymaker, Sen. Marco Rubio, R-Florida, seemed willing to consider some changes in gun laws. Facing an angry audience of students and parents during a CNN-sponsored town hall meeting in Sunrise, Florida, Feb. 21, Rubio conceded that steps could be taken to reduce gun violence. An ardent gun rights backer, Rubio, who is Catholic, said he would support raising the age at which people can buy rifles, was open to reconsidering the size of gun magazines and disagreed with Trump’s proposal to arm teachers. He stopped short of supporting a ban on assault weapons, like the kind used in the Parkland attack, saying that such a ban existed from 1994 to 2004 and proved ineffective because gun manufacturers and owners found ways to slightly change a weapon to make it meet the requirements of the law. Another Republican, Sen. Patrick Toomey of Pennsylvania, has said in the aftermath of Parkland he was looking to reintroduce legislation that would expand background checks of gun buyers. Similar earlier efforts by Toomey, who also is Catholic, have failed under National Rifle Association resistance. “He is also open to new legislation establishing stricter penalties for people who steal or illegally possess firearms, specifically those who provide false information during the background check process,” Fisher said. The NRA has borne the students’ wrath. Across the country young people have challenged lawmakers to choose between protecting students or standing with the NRA. The young sudden political activists have called for the defeat at the polls of any candidate who fails to act to ban assault-style weapons. The students have pointed to the millions of dollars the NRA spends on political activities, including contributions to candidates’ campaigns. Since 1998 the NRA has spent $203.2 million on political activities, according to data cited by Politifact. Despite the pressure from the young people and family members of gun violence victims, Wayne LaPierre, executive vice president of the NRA, doubled down on the organization’s stance that it would not accept any limits on gun ownership. “They hate the NRA, they hate the Second Amendment, they hate individual freedom,” he said. That’s hardly the case in the eyes of gun control advocates, who see assault-style weapons in private hands as a threat to human life. Archbishop Wenski welcomed the student activism. “It’s a good harbinger for the future that our future citizens will be actively engaged in the political process,” he told CNS Feb. 22. Echoing the long-standing position of the U.S. Conference of Catholic Bishops, Archbishop Wenski said “reasonable” gun control was necessary to prevent firearms from getting into the wrong hands. “The church has been engaged on this issue of gun control for a good amount of time,” he said. “We supported the assault weapons ban in 1994 and various statements and letters to (Capitol) Hill when various types of gun legislation were proposed. We generally came out in support of reasonable regulation of firearms. He also called for improved funding of mental health services, which he said had been “broken for a long time” and questioned the arming of classroom teachers. Meanwhile, the U.S. Supreme Court Feb. 20 declined to hear a constitutional challenge to a California law requiring a 10-day waiting period for gun purchases. The decision, vehemently opposed by Justice Clarence Thomas in a 14-page opinion, follows a pattern of the court in recent years shying away from the national debate on gun control. The court last considered gun cases in 2008 and 2010, when justices ruled that individuals have a right to own a gun for self-defense in their homes.